Using Digital Signage to deliver high-impact, time-sensitive info across your stores. 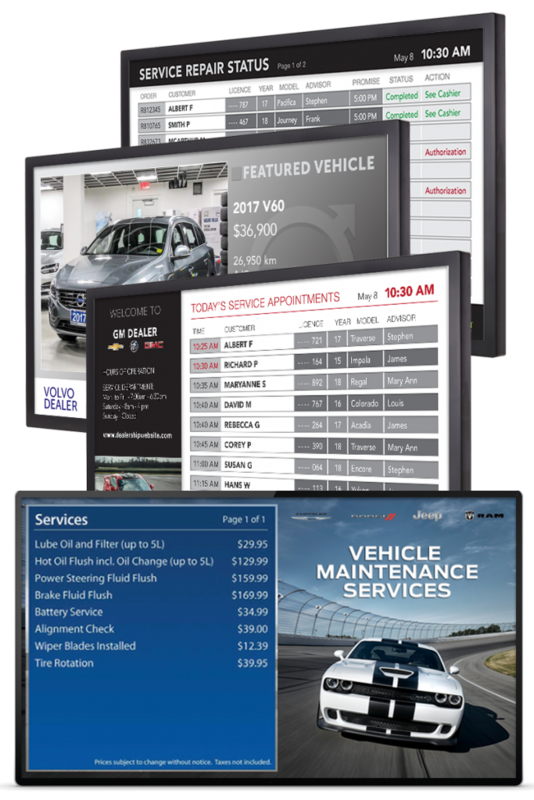 Complete turnkey integrated Digital Signage dashboards and solutions for your dealership, customized for each OEM brand. Work with our engineers to develop an impactful, cost-effective strategy using commercial-grade hardware for full viewer engagement or use your existing screens and build on your current setup. Our innovative team of graphic designers think outside of the box to develop materials that convey a strong visual marketing message. Innovative Integration technology is what sets us apart. Display data from your DMS, CRM, and other sources to provide a premium customer experience. Above all, we create and manage your Digital Strategy for you. All content is created using your brand, resulting in higher ROI values and as a result, significantly increasing customer retention. level and create a positive first impression. updates with this airport-inspired dashboard. 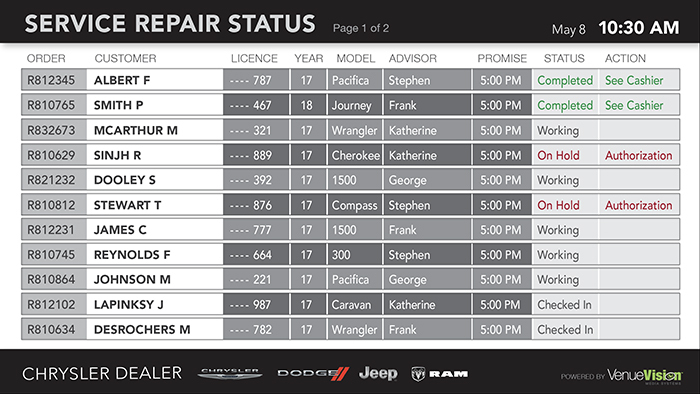 up-to-date throughout the service process. 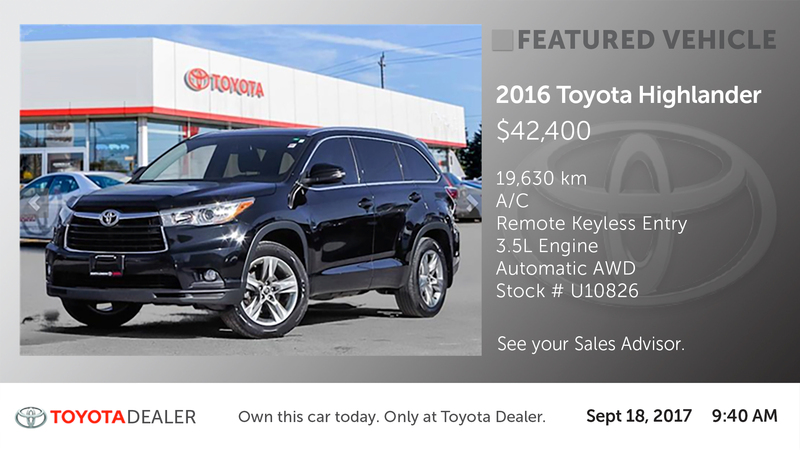 for customers to browse your pre-owned inventory. 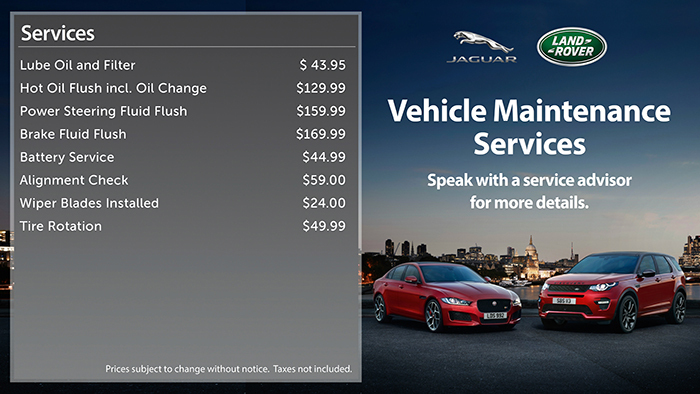 services such as collision centre, detailing, etc. sales customers when they enter for their appointment. 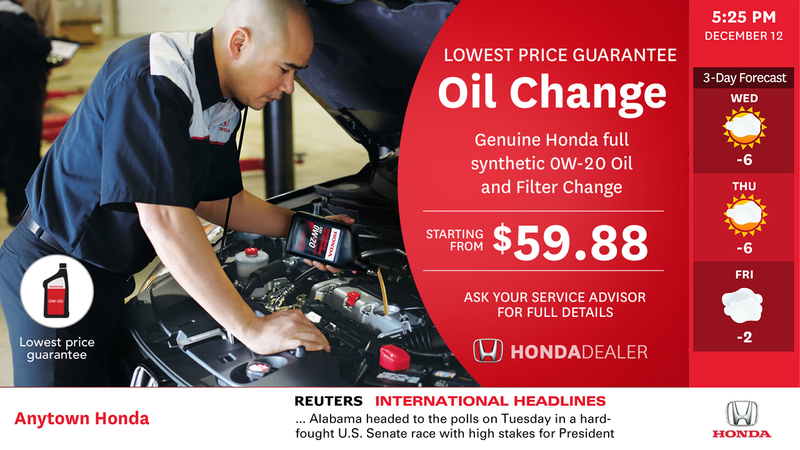 OEM specific content designed to meet brand standards. 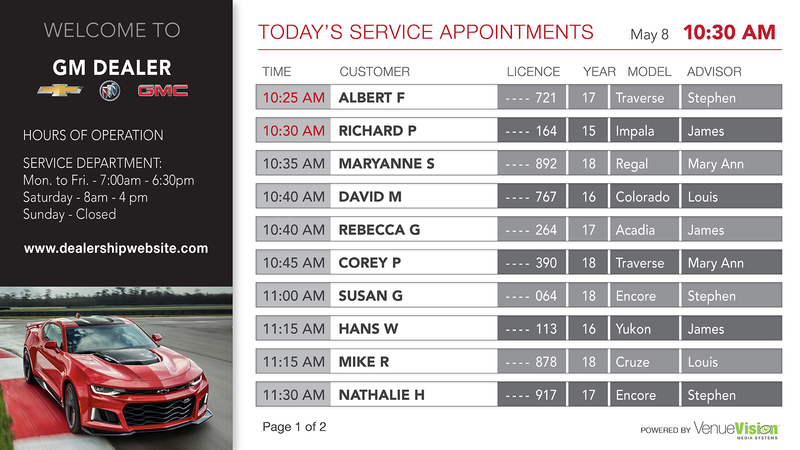 to keep your customers informed and increase ROI. automatically added into your National Content channel. We provide fully-managed OEM specific and branded HD Digital Signage content, showcased within a personalized, informational interface. 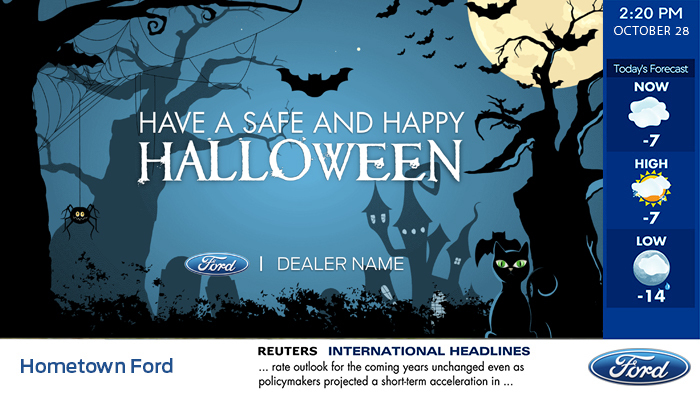 Additionally, our content covering Sales, New Vehicle Releases and Features, F&I, Parts and Service, Accessories, Manufacturer News and Innovations is always current, seasonal and refreshed regularly — as a result, you’ll never have to worry about stale, generic automotive content. 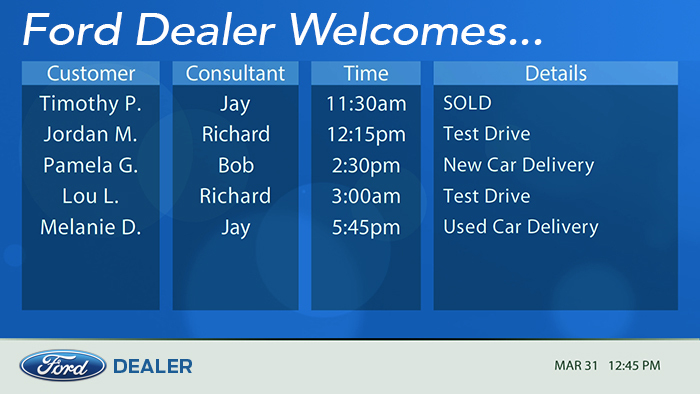 Looking for additional content specific to your dealership and your department promotions? We also provide a full range of custom content services and packages to keep your screens current, consistently branded and customer targeted. Click on one of the examples below to see samples of their custom manufacturer-branded dashboards and interfaces. 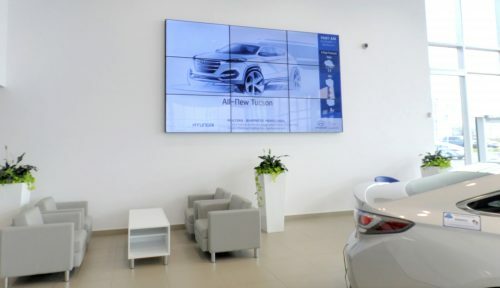 Take your digital dealership experience to the next level with this impressive, large format interactive video walls. Install for maximum impact in your showroom, reception, lobby or any other location. 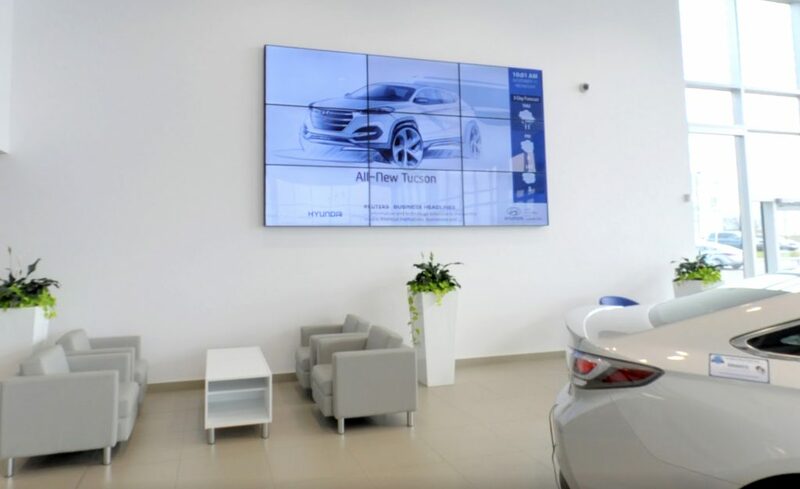 A video wall enables you to have a central entertainment and informative area that delivers your marketing, sales and service messages and promotions with big visual appeal. 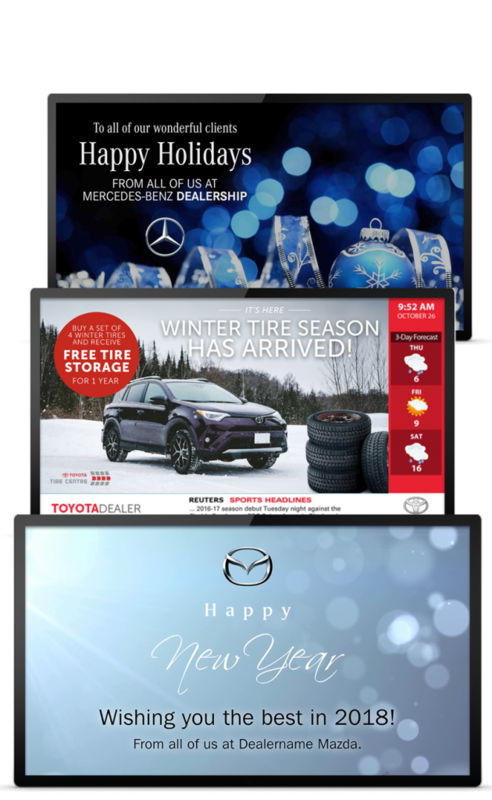 Any information can be displayed, from OEM marketing content to dealership created promotions or private sale messaging. Various configurations and sizes can be designed and installed for any wall space for maximum impact. 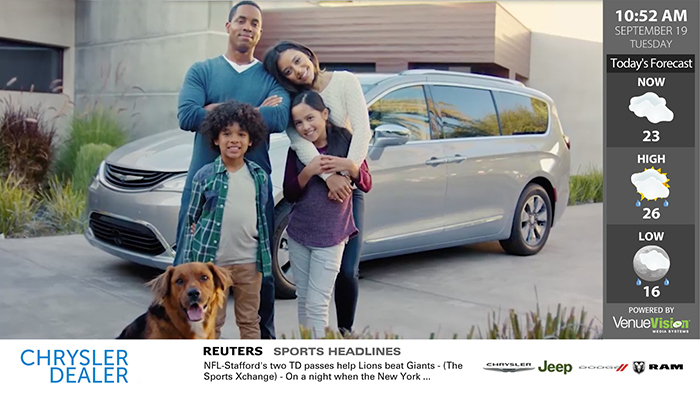 Use your existing screens or work with our engineers to develop an impactful, cost-effective strategy using commercial-grade hardware for full viewer engagement. Our innovative team of graphic designers think outside of the box to develop materials that convey a strong visual marketing message. Our integration is what sets us apart. Display data from your DMS, CRM, and other sources to provide a premium customer experience. We will create and manage your Digital Strategy for you, using your brand, driving higher ROI values and significantly increasing customer retention. 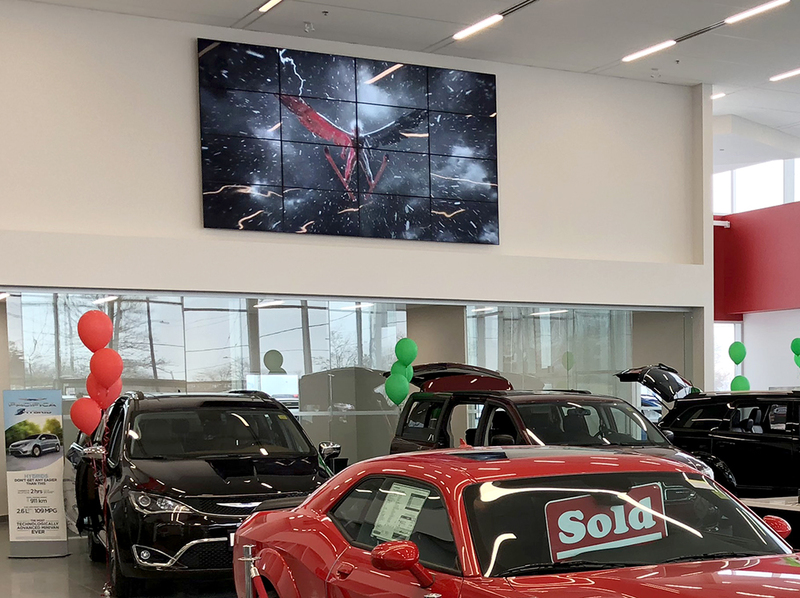 The new media that’s been displaying on our TVs is really top notch as VenueVision has systematically improved the information presented on sales, parts and service and really impacted our branding. Thanks for being a great business partner. LONDON CHRYSLER, — John O.